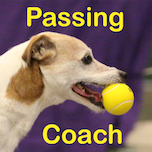 Go to the Apple App Store and search for Flyball Coach and download the App for your iPad or iPhone. Once it’s installed, Hit the Icon then go to the Settings page. Set Video Clip Length (seconds). I prefer .5 seconds, but you will have to play around with it to get the right number for you. You want it as small a number as possible so you have less images to scroll through to find the image with the exact point of when the dog is hitting the finish line. Event Name: usually it’s the team name and race number, but it can be what ever you want. It will show up later on the image so you’ll remember what team or race number it is. Hit Save. It will take you back to the Menu. Hit Start It will take you to Step #1 – Capture Clip #1, also known as the Capture Page. When you hit Start from the Menu page, there’s a clock that starts at that point, but more on that later. From the Capture Screen, position the screen so that the two Start/Finish poles are one behind the other. The wider the horizontal distance between the poles, the greater the distortion will be and the harder it will be to find the frame with the dog’s nose hitting the Finish line. You should also make sure you can see the markings on the mat (if they’re there, if they’re not, you should add them) indicating 1′, 2′, 3′, etc. For the first pass, Hit the Screen or Capture Button when the dog coming back from the box is between the 3rd (from the box) and the 4th jump. It will take .5 seconds of images. Once you get use to this, depending on the speed of the dogs, you can change this but remember, you want to get this as short a time as possible because then you’ll have less images to scroll through. Do the same for the next two dogs. After the last dog it will automatically take you to the first dog’s images. 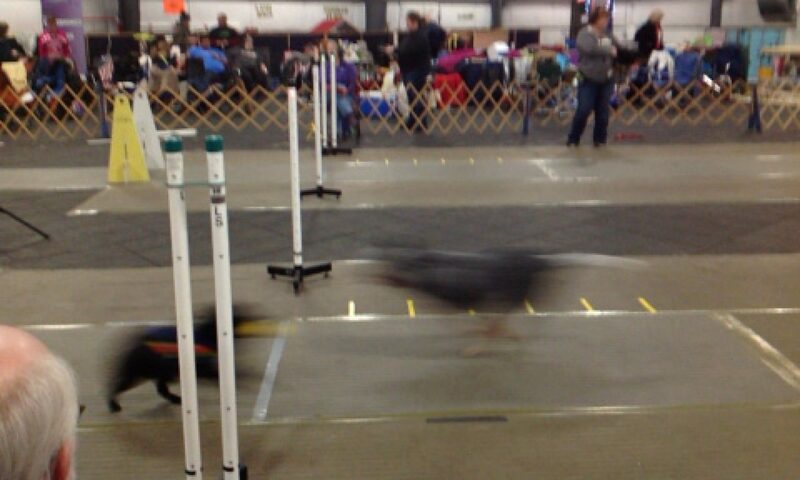 Scroll and find the image where the nose of the dog coming back is as close to the Start/Finish line as possible. You’ll then see where second dog is at that exact time. If you can’t see the second dog in the image, it must be a very large pass and the dog isn’t in the screen yet. Once you chose the image, it will quickly take you to the next dog where you scroll and find the best image again, then the last dog. Once all three images have been chosen, it will bring them all up on one screen so you can go back to the handlers and not only TELL them their pass, but you’ll be able to show them as well. Then you can Hit Save which will save the images with your photos or you can Hit Reset and it will delete them all. It will then take you back to the Menu page and you’re ready for the next heat. When you’re looking at the final images, you’ll see a black box at the top left corner with numbers. The first number is the time between when you hit start and the time of the frame that you chose for the first dog. The second number will be the same as the top for the first dog. At this point the numbers don’t mean anything, unless you timed hitting the start button on the menu with the time that the green light goes on on the EJS. When you look at the second image, the top number will be the time between the frame that you chose for the first dog and the time of the frame for the second dog, IN OTHER WORDS, THE SECOND DOG’S TIME. The bottom number would be the total time from when you hit the start button. The THIRD image is the pass between the third and the fourth dog. The top number is the 3rd dog’s time and the the total lap time. The next update of the app will have some changes, like having the start and finish buttons on the capture page so you can better coordinate/time the start of the race. That will give you a time for all the dogs as well as the time for the whole team, if you time hitting the Start with when the green light comes on.